Just seeing the Washington DC Monuments that are scattered around the National Mall will keep you occupied for a day or two. as could the U.S. Supreme Court Building and the Library of Congress. But let's look at monuments that commemorate people and events. Washington DC Monuments honor Presidents, politicians, generals and soldiers. You'll find monuments all around the city, but the most famous are on or near the National Mall. Even to visit just those, you'll be better off getting a ticket for one of the hop-on-hop-off buses that circle the Mall or take a taxi. 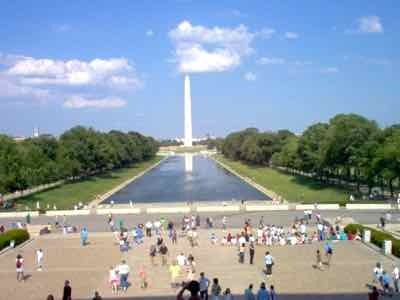 One of the first Monuments that spring to mind is the Washington Monument. It's the most prominent feature of the District's skyline. It's that 555 foot high (185 meters) obelisk at the center of the Mall. You can get great views of Washington DC from the top. Tickets for the elevator to the observation deck can be obtained for free at a kiosk near the base of the monument. Arrive early because these tickets are very popular. You can also reserve a ticket in advance by phone or internet for only a couple of bucks. 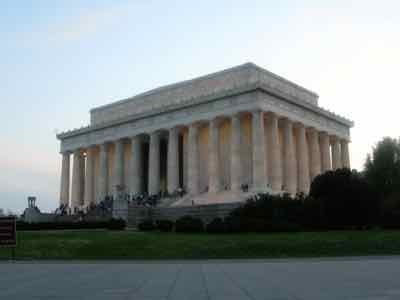 The next monument that you will want to visit is the Lincoln Memorial. This is the Greek Classical looking building that was on the U.S. penny for years. It's at the western end of the Mall. Behind it are the Potomac and the bridge to Arlington. Inside is the 19 foot high (6 meters) marble statue of Abraham Lincoln seated in contemplation. This memorial is open to the public day and night. Stand on the steps of the Lincoln Memorial for a great view of the Washington Monument, the Mall, and the Capitol Building at the other end of the Mall. 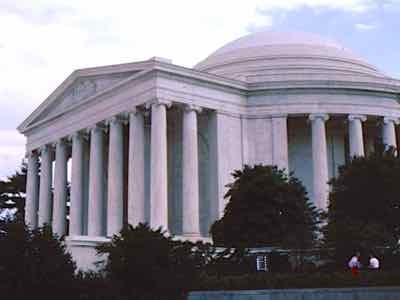 Visit the Jefferson Memorial while you're at this end of the Mall. It is located across the tidal basin. It is a beautiful domed, circular building with a statue of Thomas Jefferson inside. If you happen to be visiting in spring when the cherry blossoms are in bloom, this is especially pretty. On either side of the reflecting pool that stretches in front of the Lincoln Memorial you will find the Vietnam War Memorial, the Korean War Memorial and the Roosevelt Memorial. There is a Women in Vietnam Memorial near the Vietnam Veterans Memorial. There are several other monuments and memorials around The Mall. The World War II Memorial lies along the central part of the National Mall between the Washington Monument and the Lincoln Memorial at one end of the reflecting pool. Near the Capitol Reflecting Pool at the east end of the Mall is the Ulysses S. Grant Memorial. Away from the Mall find the U.S. Holocaust Memorial Museum. In Arlington National Cemetery you will find the Tomb of the Unkown Soldier as well as a the grave of President John F. Kennedy. Many of these Washington DC Monuments are open late at night for visits. Most are illuminated making the skyline of Washington DC truly memorable.